7th March 2012, San Jose - Fast Lane LATAM (www.flane.co.cr) won the Cisco Learning Partner Acceleration Award 2012 and was recognized by Cisco as the fastest growing learning partner in FY12 in the region. 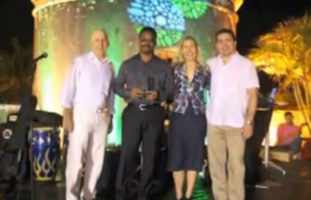 Cisco announced the Learning Partner winners during the Americas Learning Partner Summit held March 6 in Cartagena, Colombia. Throughout Cisco’s fiscal year, the Cisco Worldwide Learning Partner Channel evaluated global Learning Partners to highlight the extraordinary efforts on the part of these training organizations in the areas of Excellence in Acceleration, Collaboration, Innovation and Relevance. The Cisco Acceleration Award 2012 recognizes again Fast Lane’s achievement and alignment to Cisco as an outstanding Learning Partner in the region. Fast Lane registered 200% growth in direct Cisco-related business in LATAM, in Brazil the growth rate was even 270%.